After voters turned down a millage request in 2003, Jackson Community College dropped its skilled trades training program, leaving area manufacturers without a key source of future talent. So, they decided to do some DIY job training. Today, the Jackson Academy for Manufacturing Careers is bursting with students training as welders, machinists, computer numerical control programmers, tool-and-die makers and for other jobs in the resurgent manufacturing sector. “We launched our first welding class in 2005 and we’ve been running flat out ever since,” said Bill Rayl, executive director of the Jackson Area Manufacturers Association, which created the training academy. The academy, headed by Annette Norris, has about 400 students and runs a number of apprenticeship programs that are certified by the U.S. Department of Labor. “All of our classes are full,” Norris said. In most cases, manufacturers are paying for the apprenticeship training and the wages of workers in those programs. Most programs require 8,000 hours of on the-job-training to get a journeyman certification. Rayl said the talent pipeline started drying up years ago as high schools eliminated shop classes, career and technical centers closed, and companies stopped hiring during Michigan’s recent decade-long economic downturn. Meanwhile, manufacturers failed to project a positive image of the work they were doing and the opportunities they had available. “Manufacturing became globalized,” Rayl said. “We sort of closed our doors, hunkered down and just did what we needed to do. Today, a lot is going on. And while machines have replaced numerous factory jobs, Norris said there are many jobs that involve operating, programming and repairing those machines. And those jobs require education and training beyond high school. Norris said there’s an especially strong need for welders, CNC machine operators and programmers and welders. 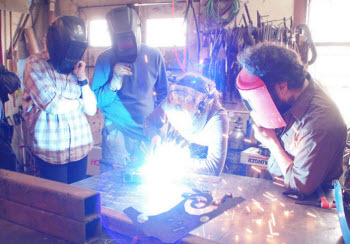 Skilled welders can make as much as $25 to $30 an hour, she said. The demand for welders might seem odd to those who’ve been inside an auto assembly plant where robotic welders appear to be doing all the work. But Norris and Rayl said there are many welding processes that are more efficiently performed by humans. The problem is that many humans stopped becoming welders as demand for them ebbed during the past decade. But the manufacturers association isn’t just working to fill immediate job openings. It’s working with K-12 schools in the area to inform students about career options in manufacturing and provides training for students who want to enter the work force out of high school. The association also sponsors an annual manufacturing summer camp for sixth graders. Rayl said it will take years to raise the status of manufacturing as a viable career option. I wonder what the cost/student is for this program? David...costs per our individual apprenticeship track courses varies from around $300 to $600...including all course materials, textbooks,etc. No extra fees or stuff to buy. On average, cost per year is between $2,500 and $3,000 per apprentice, so the total investment that companies are making is between $10,000 and $12,000 per person for the classroom training. That is, of course, in addition to paying each individual's wages and there's an investment from the companies related to the "on the job" training that takes place over the four years of the apprenticeship. On the flip-side, the benefit to the companies in increased productivity, higher quality workmanship, etc. makes apprenticeships very attractive and cost-effective. This is the model industries should adopt. Employers know what industry specific skills they need. Industry can And does change with the technology and need not based on depreciation or the next college budget prayer cycle.